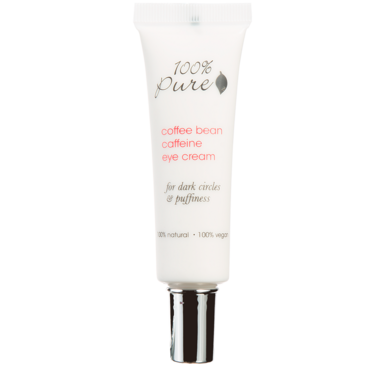 The 100% Pure Organic Coffee Bean Caffeine Eye Cream is an anti-inflammatory, caffeine rich, gentle eye cream that features green tea and coffee to de-puffs while increasing circulation to brighten dark circles and reduce the signs of fine lines and wrinkles. Concentrated with potent anti-aging vitamins, antioxidants, and nourishing rosehip oil to make eye area look more awake and more youthful. Truly, 100% Pure. 83% saw immediate reduction of puffiness - Good bye to puffy eyes! 73% saw an immediate reduction of dark circles - Say no to dark circles! 87% saw reduction of dark circles with continued use - Say yes to more healthy, beautiful, youthful looking eyes! To use: Dot cream around your eyes. With your ring finger gently pat around the eye area. Don't tug! The skin around the eyes is extremely delicate. I was looking for an eye cream to reduce my dark circles and to be a grwat base for make up. It's not working for reducing my dark circles (it seems nothing works for me) but I still like it. It absorbs well into the skin. The smell bothered me at the beginning but I got used to it. It smells like something very sweet. Love this product!Works great and love the smell! Works great, and smells exactly like the cream in an Oreo cookie. Smells amazing, works well too! I didnâ€™t notice any of the benefits listed for this product. I was disappointed as I was really excited about trying it. It does smell amazing though. Iâ€™m enjoying this product. I apply it several times a day. I believe it has reduced the puffiness. It doesnâ€™t irritate my eyes at all. I will continue purchasing it. Perfect. Even for sensitive skin. Smell like cookies or cake! Miam! Haven't used it long enough to know if it will help with puffiness under my eyes. It smells like roasting coffee and goes on very smoothly. Not greasy at all. Need only a tiny bit under eyes every night. I like it but am not sure I will purchase again. If you have sensitive skin in any way, please be very careful with this product. I was so excited to try this, but unfortunately it irritated my skin a lot, turning my under eyes red within a couple of minutes of applying. Please make sure to read the reviews on the 100% Pure website because this seems to be a common occurence. It does smell great, but be careful if your under eye area is sensitive! Seems good...shadows definitely fading. Don't need much so expect it will last. Lovely smell going on but doesn't last. Love this eye cream. So much! Definitely worth the money and works like magic. Even better when it's cold. Iâ€™ve been using 100% Pure coffee eye cream for a few years now. I always make sure that I donâ€™t run out, I use it everyday. Love this produce. It does exactly what it says. People always tell me I donâ€™t look my age and Iâ€™m in my early 40â€™s. And I love that fact that I can get it through a Canadian company. Best eye cream out there! I'm in my early 30s and the working life caught up with me and I started noticing dark circles and bags under my eyes. I've tried several different natural eye creams and didn't find it moisturizing enough or too thick/oily. 2. It actually works! It was moisturizing enough throughout the day and I have super dry skin especially in the winter. It doesn't get chunky like some natural eye creams. Really happy and thankful I found this product!! It's these little things that make a huge (self care) difference to my day!! I have been using this eye product for several years and love it. It immediately gets rid of wrinkles under the eyes. You do though have to use it again throughout the day. A very small amount goes a long way so it is worth the money it costs. I have spent a kings fortune on eye creams with everything from Lancone, Clinique, Clairins etc with little results. After one weekend of use this cream has blown me away. It is amazing at reducing puffiness and fast. I now have eyelids again! Stop wasting money and try this cream you'll love it! This is a great eye cream! I love it. It smells great, and just the right texture, not too greasy, and not too watery. Also, great value for the price. Love this eye cream. Only need a small amount of product so I know it will last for several months. Very moisturizing, creepiness under eyes is gone! This eye cream also has a beautiful soft scent which only lasts for a short time when applying. A must have!! Love this product; just bought my third tube; great amount for the price; and it does what it says... love all the 100% pure products! Smells amazing! Very nice cream. I bought this product because of the fact that it's made with all natural ingredients, and the smell is very nice too, but so far it really seems to be working, because I don't wake up with swollen eyes, and I look rested! Nice packaging too. Still unsure if it is reducing puffiness and dark circles but it is very moisturizing and smells wonderful. I really wanted to love this product, but thus far it hasn't reduced the dark, puffy circles under my eyes. Having said that, I will give it more time in hopes that it will perform as it has been reviewed. I'm not sure how well this works. I had to stop using it because the smell was so overwhelming it was making my eyes water! Usually a little natural fragrance is alright in skincare products but this was to much and did not seem to fade away. Really like the moisturizing effects of this. I can't comment on any eye darkness or puffiness reduction. It goes on beautifully and smells wonderful too! Moisturizes, but sadly I have not noticed a reduction in under eye darkness even though I have been using it twice a day for 2 months. Smells great though, like cookies! smells delicous. nourishing for my eyes - especially from this long dry winter. worth the price! This eye cream smells sooooo goood! It doesnâ€™t take long to notice a difference. I use it once in morning and once at night. Itâ€™s a good sized tube for the price. I love that itâ€™s natural. Highly recommend. I am in love with this undereye cream! It smells so delicious! The natural ingredients really agree with my skin - from the very first use I noticed how soft, nourished and hydrated my undereye area was. I also use this on my eyelid as a have hooded eyes. It helps with the puffiness of my eyelids and feels amazing. I sometimes use this as a facial moisturizer too! Love this product! It reduces the puffiness I experience upon waking up in the morning and it smells amazing! I use this morning & evening â€” itâ€™s the best and longest lasting eye cream Iâ€™ve ever used. I ordered a 2nd one because this tends to sell out but donâ€™t think will need for awhile and Iâ€™m on my 8th month with the first tube â€” well worth the price. I really do like this cream. My skin is so dry I love that itâ€™s on the oily side - I find it helps to de puff and help me wake up in the morning. Will repurchase but wish it wasnâ€™t so pricey. Have to be honest that Iâ€™ve not used the product daily. It has a lovely scent & moisturizes the under eye. Have not yet determined if it helps extreme puffiness, seems to help with minor under eye puffiness though. Does not address the dark circles I sometimes wake up with. Maybe if I was more consistent in using the product? I've used this product for several years and love it for under my eyes. It immediately reduces lines and puffiness. It's fairly moisturizing and not irritating for sensitive skin but I don't find that it really does much beyond that. It's thin but on the oily side and takes forever to absorb so it really doesn't work under makeup. Has a very strong but pleasant cookie smell. First of all, it smells delicious. Not a pre-requisite for a good moisturizer, but a nice perk. I bought this on a whim but I've been surprisingly happy with it. It's actually really great! I discovered from another product ( a syrum) that coffee helps with dark circles so I thought I'd give this a try. I'm very pleased with it and would probably order it again. It smells delicious, absolutely love the smell but doesnâ€™t seem to make any difference to my dark circles. I had high hopes after reading all the good reviews, I guess I have very stubborn dark circles. nice texture, easy to dispense and the bottle will last a long time. My absolute favourite! This eye cream is great and really helps with dark circles and puffiness! Plus I LOVE the smell! Amazing product! Love what it does to my eyes! Feels wonderful and smells great. Love the hydrating effect on my eyes .. not heavy or greasy! Great price too! Love it, so smooth and smells great, makes a noticeable difference for my eyes! Love, Love, LOVE this product! I had very low expectations for this since every other under eye cream I've tried has done little (if anything) to reduce puffiness and dark circles. I'm in my mind 20s but my job has aged me dramatically lol. This has reduced almost all of the puffiness under my eyes, and lighted the dark circles under my eyes by about 50%. I look so awake and well rested now. I'm excited to try other products from 100% pure. Really like this product. Find that it does work better to depuff the under eye than most products I have tried in the past. Important to mention that I have a lot of puffiness and am realistic about this when trying new products. It isn't a miracle but caffeine works well and better than most other ingredients. I'm not sure it has done anything to improve my dark circles or puffiness but it smells good and it moisturing. It doesn't irritate my eyes even though I am very sensitive.